DOHA, Qatar — Gulf Arab states on Monday welcomed the nuclear deal negotiated between Iran and world powers but said they would like further assurances that the U.S. would help them counter increasing Iranian assertiveness in the region. Speaking for the six-member Gulf Cooperation Council, Qatar’s top diplomat said Monday that the bloc had been impressed by U.S. Secretary of State John Kerry’s presentation of the agreement and explanations of how it will be verified and enforced. “Consequently, the GCC countries have welcomed on this basis what has been displayed and what has been talked about by His Excellency Mr. Kerry,” said Foreign Minister Khalid al-Attiya, whose nation currently chairs the group. He added that the Gulf Arabs ultimately would like to see a ban on nuclear weapons in the entire Middle East — a pointed jab at Israel which is widely believed to have the bomb — and that the Iran deal could be the first step in a process to bring one about. 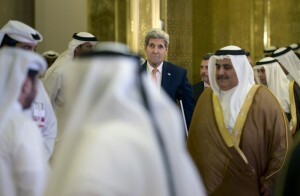 At the same time, he said GCC members remained concerned about Iran’s possible designs in the region. Kerry had come to Doha seeking to ease such fears and said the United States would continue to expand security cooperation with the Gulf states to counter any destabilizing activities from Iran or others. “Once fully implemented, the (Iran deal) contributes to the region’s long-term security, including by preventing Iran from developing a military nuclear capability,” Kerry said, reading from a joint U.S.-GCC statement to be issued later. He said that the nuclear deal might or might not have an effect on Iran’s behavior but that the U.S. and its allies must plan for the eventuality that it would not. “Every state in the region hopes that there could be a change but we have to prepare for the possibility and eventuality that it won’t,” he said. Among the steps under discussion are developing a ballistic missile defense capability, expediting arms transfers, special forces training, maritime and cyber security programs and a significant boost in intelligence sharing, Kerry said. Working groups on those issues will begin meeting next week in Saudi Arabia, he added. All of those are part of a package of programs that he said would build “stronger and more enduring strategic partnership with particular focus on counterterrorism and countering the destabilizing activities taking place in the region,” he said. Kerry’s main goal, however, is to follow up on a May meeting that President Barack Obama hosted for Arab leaders at Camp David. At that meeting, Obama promised Bahrain, Kuwait, Oman, Qatar, Saudi Arabia and the United Arab Emirates enhanced security cooperation and expedited defense sales to guard against a potential Iranian threat. “Today we made progress on what we laid out at Camp David but clearly there is more work to do,” Kerry said. Just last week, the State Department authorized the sale to Saudi Arabia of $5.4 billion in Patriot missiles and related equipment along with $500 million in ammunition. Saudi Arabia is the largest and most influential member of the council and has been publicly supportive of the Iran deal, albeit with reservations. Kerry’s visit to Qatar follows one last week by Iranian Foreign Minister Mohammad Javad Zarif, who also stopped in Kuwait and Iraq to present Tehran’s side of the nuclear deal. “Permanent security cannot be achieved by endangering the security of others,” he wrote, proposing setting up a regional gathering for dialogue whose aim would be to respect each country’s sovereignty and independence. In Doha on Monday, Kerry was also meeting separately with Russian Foreign Minister Sergey Lavrov and Saudi Foreign Minister Adel al-Jubeir to discuss Syria. The three-way meeting is unusual, particularly as Russia has been a prime backer of embattled Syrian President Bashar al-Assad, while Saudi Arabia and the United States have been calling for his removal.